What is the Simple Living Pledge? This is a solemn and personal promise to live a simple life in a complicated world. Simple living is the conscious act of cleaning your mind and surroundings of clutter and filling the space with the things that you value. After spending years entangled in stress, multitasking and clutter, 3 years ago my family started a conscious simplifying process in all aspects of life and now I am the first to sign the Simple Living Pledge. By taking the pledge you are making a conscious decision to keep your sanity in a modern life, where everyone is screaming the opposite. It has long been known that after you make up your mind, the next step to fulfilling a wish is to write it down. Signing your name and pasting the badge on your blog/website is what will serve as a reminder to slow down, relax and look for the simple truths in life even when you are tempted to forget and get back to normal. Let simple be your new normal! Who can take the pledge? Anyone - regardless of age, nationality or language. You don't need to have a blog or website to sign the pledge. The only thing you need is willingness to live a better, simpler life. 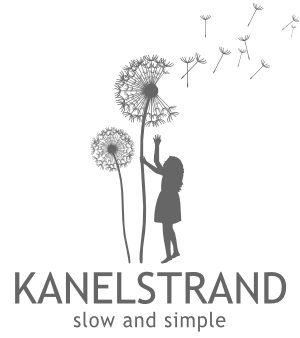 On February 1st 2012, we started a Simple Living Challenge on the Kanelstrand blog. Together we took 3 weeks of simple living where we discussed different aspects of simple living and challenged each other to see our simple decisions through! You can go through the full list of the steps we took during the Simple Living Challenge here. Join them by signing the pledge above! Due to the incredible amount of people taking the Simple Living Pledge, I am no longer able to list all names. Instead, I will be updating the total number of participants! Nicole Sylvia, Denver: What a coincident! Trying to live a simple life is one of my New Year's resolutions. Can't wait for the challenge to begin! Laurie Fortier, Canada: This is a life changing pledge and I am thrilled to be a part of it! Julia Atwood, Ventura CA USA: This came with perfect timing... Thanks Sonya for being the muse and support to a greener and simpler life! 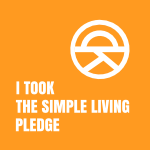 Daphne, Wichita KS: I take the simple living pledge. Laura, Kentucky: Happy to take the pledge. Each day I am striving to live the simple life. Laura, Canada: Ditto! This is a worthy goal in our consumer oriented world. Happy to be part of the Challenge. Katherine, Oregon: I've been striving to live simply the past few months. Thrilled to see this challenge as it will help me continue to develop and practice simple living habits. Patricia Kemp Blackmon, Kingwood, Texas: This is the best idea. I am all for it. Sign me up! Adrienne, Bellingham WA: Sounds like a great idea! Jamie Gentry, Canada: We live a pretty simple life, but I am always looking for more ways to live simply. Ajax, Oregon: What a great concept, glad to join in to be reminded to keep it simple! ELK, Texas: I strive to embrace a simple life at home and at work , in my art/shop, so happy to make the pledge here! MaryW, Masterton, NZ: There is warm contentment in trying to live sustainably. Ginger: I really hope to do better at these things this year! Debbie Bosworth: Hi Sonya,I will take the pledge! Thanks for creating it! Who doesn't need more focus in all the areas you suggested? I know I do! Happy Simplified New Year! Hot Coco aka Ellen, New Hampshire: I'm already on this path - have been for about two years - but I love that this takes it to the next level, and makes room for a public commitment, and sharing. Thank you! Sally, Plymouth, UK: I live very closely to these principles already but there is always room for improvement and learning from others. PatR, NC: Great way to start 2012! Kelly, NS Canada: I've been wanting and slowly starting to do this for a while now. Can't wait to really get into it. Janis T, Fresno, CA, USA: I'm ready!! Beth Terry, Oakland, CA: Thank you for doing this! A major aspect of de-plasticking for me is buying less stuff... consuming less in general. But there are other kinds of consumption -- how I spend my time -- that I need to simplify. Cindy Riggs, Huntsville, Al: I am so ready to live more simply. Marina, New York: Life is fast, busy and stressful in New York and the space is scarce, which taught me not only to de-clutter, or use less but also to appreciate every single minute of our lives. Living simple life is already helping me to prolong those precious moments, so I am only happy to take this pledge! Angela: I've been reading about minimalist living, this fits right in! Maja, Serbia: I found what I needed in your game. Will contact you soon with my ideas. Thanks a lot! Joen, New Jersey: I am up for this challenge... I will be trying to sew as much of my wardrobe as possible, and using up my stash fabric instead of buying more. Cleaning out and donating is on my decluttering list. I am also going to try to stretch my food budget with creative cooking and adding on to my vegie garden this summer. And thanks Marina over at Frabjous Couture for mentioning this challenge on your Blog! Wendy Monette, Canada: Nice website, thank you for caring about the true self in you and others. Jen S., Ogden Dunes, IN: I love this! Cheers to Simple Living!! Melinda, Connecticut, USA: Hi Sonya ~ this is the easiest pledge I've ever taken! ;) Living simply becomes such a way of life, there can be no turning back once the joy of simplicity is discovered! Valerie, Chicago, IL: What a wonderful idea, I'm looking forward to the challenge. Jenifer: I have been trying to this but not sure how to implement. So thank you! Kelsie, Montana: I look forward to this! Maree, South Africa: I'm pledging to say hello to simple Living. And so it is. Brenda The Wilted Magnolia, Georgia: I'm in! I'm a hoarder and I need help! Anne, South Florida: Some of these ideas are things that I have been doing for awhile;others, not so much. I love the idea of collecting experiences instead of things! Sacha Kay, France: I take this pledge for the three weeks to start with. Is that okay? Cindy, Connecticut, USA: I LOVE this idea! Sharyn Dimmick, near Berkeley, CA: This came right in time for me: I am facing my annual attempt at de-cluttering my living space (which is also my painting space, writing space and bedroom). I look forward to virtual company along the way. I will be on a writing retreat February 5-12, so that should help -- I don't generally take clutter with me or acquire any while on retreat. Amy: This sounds wonderful and right in line with what I'm working towards. Thanks! Ryan Elizabeth Cope, Burlington, VT: This is something I really need... taking time to appreciate all that I have and be more positive when things around me are sort of grim. Thanks for the opportunity to take part in this pledge! Pam, Vermont: I have been working on all these aspects of a simpler, richer life. Glad to take the challenge! Sandy, California: This sounds great. Will comment on it in my social media and add it to my 43things goals and see what happens. Jeannie Goldwire, Austin: So far, I have been following everything in Theory, but not in Practice so much. I want to try again. Thank you. EcoCatLady, Denver: Well, I've been simplifying for over 20 years now, and have come to the conclusion that, like all things, living simply is a journey not a destination. So I happily take the pledge. Maggi S., Tampa, FL: I downsized to a 330 square foot apartment 6 years ago and sold my car too. I have lived the simple life for a long time and enjoy hearing about others doing the same. Glad there are so many of us and love this blog. Thanks. Tracy, San Francisco: It's like you read my mind and posted my 2012 resolutions. Thank you and good luck to everyone signing up. Ashley D.: I'm so excited for this! :) I love simple living & I know the 3 weeks will benefit me so much!! Johanna, Virginia, USA: We are a family of eight. We take the challenge of living a simpler life and to enjoy every minute. Thank you. Heather, Oregon: I've been simplifying for years now but there is always room to grow and how exciting to know other folks are making the same commitment! Margo, Austin TX: We've been on this path for awhile now. Look forward to taking it to the next step. Sharon, Seattle: I can't wait to get started! Tracey TieF, Toronto, Ontario, Canada: I am looking forward to some de-cluttering encouragement and to offering helpful suggestions on making your own simple healthy body products. I am working up the nerve to separate my work life from my non existent personal life so that I can enjoy myself and my family. Sashira, Canada: Always looking for ways to simplify. Wendy Schroeder, Canada: Trying to be waste-free has led to simplicity, this will help will the focus! Rebecca, Alaska: Can't wait to start. Helen Strydom, Durban, South Africa: While I already try to live a simplified life and try to encourage talking rather than TV and texting, I'm signing up to learn more. Thanks for running the Challenge. Tasmanian Minimalist, Australia: I love this. I will support you in any way I can. Love your work, love your site. Thanks for emailing me. Taylor, Austin, Texas: Right in my line for my goals this year-super! Carmen, Denver: I've been striving for this very thing for years. It's a constant journey, and this is a great reminder to keep at it! Bill Peregoy, Lawrence, MA: This is perfect as I've been trying to live this way to start 2012. It will be so nice to have a virtual community to share the experience with. Thanks for doing this! Eve Stavros, Charlottesville, VA: Great! I started last year, by de-cluttering my house (I thought), downsizing, and am in the process of moving and consolidating. This will give me some much-needed encouragement and hopefully some new ideas! Karen, NY: Totally in line with my "De-CLutter 2012 Challenge" so this should be easy peasy! Åsa, England: Sounds very interesting, I aim happy to join you all! Rose, Vermont: Sounds like something I need! 4BushelFarmgal, Southern New England: I'm looking forward to this challenge! Count me in! Diane, Oklahoma: I have participated in Project 333 since last winter and felt a new freedom. I think taking this challenge will take me to another level. Cherie, Virginia: My goal for this quarter is to live a more sustainable life and to share various ways I do this on my blog: http://renaissancegardenblog.blogspot.com/. Looking forward to the discussion in February! Yaga, France: Cool! I've been doing this for about a year now and have come a long way, but there is always more! Looking forward to be doing this with a group of like-minded spirits! Erin, CA: I definitely need to focus on prioritizing what is important to me! Myra Roldan, Milford, CT: I've joined Karen's De-Cluttering Challenge and I'm taking on the Simple Living Challenge. I've spent the past two months decluttering mentally and it's time to declutter and simplify my life. Kathy B, Upstate NY: With the financial mess this country is in, I want to live a more frugal life. My wish for the new year is freedom from all of the worry and strife! Paige, United States: This is a great idea! Very excited to get started. Elaine, Ontario Canada: Sounds good to me. Jonathan Weisblatt, San Francisco, CA, USA: Beautiful. Getting to the heart of .. well, everything about Life. :) Makes me think of Thoreau and of Jim Merkel's 'Radical Simplicity.' Thank you for this form and forum, vision and support, Sonya and everyone! Janet, Arlington, Washington: Love having a village to help me focus! Nienke, the Netherlands: Thanks a lot for doing this! Also, I have a small addition to make to your list: - And if I don't succeed on every day in every way, I won't be mad for it. Makes it all the more simple! Ea, Manila, Philippines: I am excited and nervous at the same time, but I'll try my best to go by this pledge! -elevating MY experiences above MY possessions. I LOVE this idea. I am in! Thank you to Deb of Deborah Jean's Dandelion House for sharing this great idea and challenge with her followers. Elisa McLaughlin, Hume, CA: Thanks for asking me to join I am posting this to my blog in a post by the end of the week. Can't wait to be a part of it. Thanks! Kandi, Charleston, SC: This is exactly what I've been looking for to get me started! LindaQ, Wisconsin: This will be a stretch for me but is stepping towards the kind of life I want to have. to slow it down. Cheers, Carol. Katherine Pilolla, Oregon: I am so thrilled to see how many others desire to live simply. I've been working towards this the past few months and this is just the encouragement I need to keep growing "simply"! Thank you!! DebbieK, Colorado Springs: I've been trying for awhile but I could use some group support. mj: I've been practicing simple living for a while now... Still having problem with wanting more stuff!! Working on that. Javie, United States: Love this! Lin, Youngstown, OH: A perfect way to start 2012! Debbie Clauer, Ohio USA: I need this!!!!!! Gail, Washington State: Awesome goals - much needed. Tracy, Montgomery, IL: Can't wait to start this, just hope I can get my husband and 5 kids on board! Kathy O'Hara, North Idaho, USA: Rock on! Cooter Bushey, Vermont: It's a start. What we also need to do is use our cars less, take public transportation to really affect change. Kat, South Carolina: I look forward to simplifying and sharing with others who want to as well! Laura, Winnipeg, Canada: Live simply, so that others may simply live. Jerimi, Idaho, United States: Can't wait! Heather Hogan, Wisconsin: I already try to keep it simple, but there are a few aspects of my life that could use de-cluttering right now. Brooke Buffington, LMT, United States: As a massage therapist and naturalist, this definitely describes what I would like to do for myself, my family and my business! Sarah, British Columbis: I'm in! Marie @ ...And Poodle Makes Three, USA: Excited to start this pledge - what a great idea! I've been learning to live frugally and simply, this will be a wonderful experience. I'll be blogging about my experience at my own blog http://poodlemakes3.blogspot.com/ - I'll be sure to spread the word about this challenge! Sarah Deragon, San Francisco, CA: Bring it on! I love a challenge. Andi Luther-Philippe: I just found your blog today, and I love it. Thank you. Carol, Adelaide: I love this! Daughter Earth, San Francisco: This is EXACTLY what I need right now!!! Vanessa Williams, United States: This sounds great! Count me and my blog asimplygoodlife.com in! Chanel, Blairsville, Ga: I'm already there but I tend to stray, the pledge will help keep me centered. Louise, Taiwan: Looking forward to it! Robin Dunbar, United States: Thanks for the opportunity to make a pledge. I'll post this on my site baybabies.blogspot.com. Marianne, Hamburg, Germany: Thanks to my daughter I found this website. It's always been my aim to simplify my life, grow a few vegetables in my garden, make clothes, household items etc. myself and try to teach others to appreciate home-made items (also recycled ones) more than those bought from stores. Jennifer, New Port Richey, Florida: I am trying with baby steps. Cheryl Chambliss, New Jersey, USA: As Thoreau said, "Simplify, simplify." Heather: I will enjoy every minute with my little man, husband and dogs. I will declutter and not stress over things I can't change. Jodi Mollard, Australia: A constant challenge i am aspiring to achieve in small ways with my husband and 5 children. Keili Rae, Harrisonburg, VA: I'm starting some new projects and I'm more excited about the goal than the hard work it's going to take to get there. This has come at a perfect time! The Green House, United States: Thank you! Winn, California: Perfect timing! Can't wait to hear your insights. Chelsea, Portland, OR: I'm excited that Beth Terry is going to be one of the contributors. Can't wait to start this project! Orge Orphelin, France: I'm already living a simple life. In my opinion. I'm curious on how this simple living pledge will make my life even more simple! Love this initiative! Meri, Canada: I am totally on board. Thanks for offering the pledge. michelle: I just found your blog through Debbie's. I am going to take the pledge. I need a simple life. Candi @ min hus, Ohio: Just found your blog and am totally loving the idea of this challenge. I'm in! Robin Malloy, Hershey, PA: I SO NEED this pledge in my life right now. Bridget, Wagin, Australia: This is my 2012 challenge, as well as being a single mum! Looking forward to simplifying! Catherine Love, Texas: Thank you for this timely challenge :) ! Sherry M., Indiana: To open my mind with such a change is like a breath of fresh air swirling around picking up all the things that needed taken away. What a great idea..
Nancy Nordman, Palo Alto, CA: I'm excited to meet with people who have similar values and priorities! Yvonne, North Georgia Mountains USA: I was so happy to come across your blog. It's that extra push to do what I have know I need to do. I start now! Amanda, Toronto: A pledge of three weeks which lead to months, years and decades. Marikay, Holualoa, HI: Yes this is the time to declutter my life and live life more fully. Without the "things" and to appreciate my family and friends! Elaine Y, Calgary, Canada: How encouraging to see that there are many others out there striving to live simply! Definitely a goal of mine that I am always working towards so I'm happy to take the pledge! Heather, Ontario, Canada: So looking forward to this challenge, thank you!! Delona, Atlanta: Oops, I'm a little late. Erin Nordin, Sask, Canada: It's time to simplify my home and everything else! This is good. Shannon Joyce: Less is more! Jennifer McLean, Nanaimo, BC: What a lovely idea, I was just saying today that I have to "thin the herd" in my life and on my TO DO list! This badge will remind me daily to slow down and smell the roses, so to speak. Tiffany, Cornwall: It feels a little difficult to keep my life clutter and stress free at the moment. I'm in my final year of Uni with a ridiculous amount of work and am currently hunting for a job and a flat in a city I've never been to before. Then again, perhaps that means this is the most important time to keep calm! Natalie, Provo, Ut: I just started reading a book called "Organized Simplicity" by Tsh Oxenreider and while the ideas in that book are not radically original, reading this book has inspired me to live more simply. I am glad to take the challenge and I hope I can be honest about how I currently live and how to change that. Rosie, Australia: Hi, sounds like a really inspiring project.. can imagine doing it with others would only help you stay with it. As they say, one step at a time, but the ethos is inspiring! Elizabeth: It brings me so much joy to connect with others with similar views and desires. Brooke Hampton, United States: I LOVE THIS!!!! Sheila Dean Kretzschmar, Alabama: I would like living the Simpler Life. Receiving from others their shared idea's will be great. Marie-Louise, Italy: I love it! Great Idea! It's nice to be in a community; it's much easier reaching a goal. Alejandra, Argentina: Cada dia es una meta a lograr. Gracias x la idea ! Linda, Melbourne: I began striving for a sustainable lifestyle 23 years ago after hearing David Suzuki on the radio talking of floods in 20 years' time if we didn't change our ways of living. Have there been more floods in recent years than ever before? Morgan, Quebec: It's so good to see something like this on the net, and that there are so many united with this belief! Jan: I have been striving to live simple and declutter for months now, but have a long ways to go. Tammie, United States: I've been slowly working on this for a few years now... the de-clutter part is hard, I love my stuff.. but it is slowly diminishing. Cloud technology is lovely, its easier to get rid of books and movies knowing I can access them again in other ways without keeping them in my house. Barbara Bell, California: Thank you for articulating what I live...I will pass this forward. Lisa O., Massachusetts: Love this! Laurie: I was delighted to find this today, this has been the way of life for us the last 8 years, perfect balance for us.We made a drastic mover from country to city, from 4 bedroom house to 600 sq ft condo and love every minute of, so freeing and enabling it is just have what we need and no m ore.We keep only what we truly need or truly love and find this way of life is the only way we could live now. What a great pledge to start the new year! Looking forward to reading your blog more. Thanks! I came over tonight to see how many people "we" had signed up! I actually thought "we" in my head! It's so exciting to see how you have motivated so many of us Sonya!! Laurie, you are so right! It's WE of course! This is our common effort and I thank you so much for taking it to heart. Your support means a lot! I am totally in! This is something I have been thinking about for awhile, actually. I am glad to know that I am not alone and also to see that you were able to put into words what I have not been. I look forward to discussions with everyone and also to reading your blog. Thank you! Thanks for joining in, Jennifer! Having company along the way is the best thing we can do! I love the map Sonya! What a great idea. Look at how many people you have inspired around the world. You are amazing!! We are amazing Laurie, we are all doing this together! Thank you for your help and support! This sounds like we are on the right track! Thank you so much for your nice words! I wanted to let you know that I posted about your challenge on my blog! Mahalo! Feel so blessed to get connected with a green/ ethical community. Please support and engage with one another. Find us also, Ecolicious Indonesia on twitter and facebook.